A section of the 254 km expressway that opens to traffic on September 21, 2014 to link Hanoi to Lao Cai in northern Vietnam. Vietnamese transport authorities on Sunday opened a 245 km expressway, the longest of its kind in Vietnam, to traffic on Sunday, halving the travel time between Hanoi and Lao Cai province. The opening of the Noi Bai - Lao Cai expressway took place in a ceremony held yesterday morning in Bao Thang District, Lao Cai, in the presence of Prime Minister Nguyen Tan Dung, who cut a ribbon to inaugurate the new road. 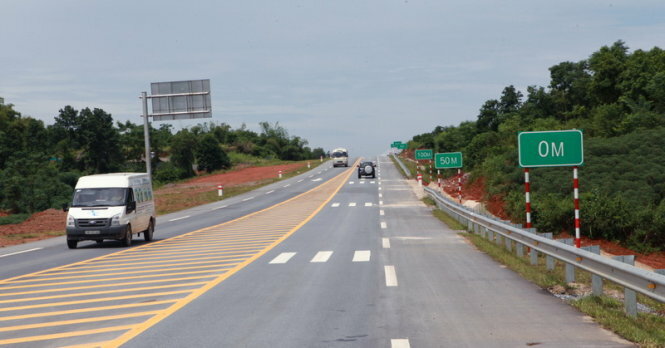 The expressway runs from Hanoi’s Noi Bai through the provinces of Vinh Phuc, Phu Tho and Yen Bai before reaching Lao Cai, said the Vietnam Expressway Corporation (VEC), the new road’s investor. The Hanoi-Yen Bai section has four lanes for vehicles, with a speed limit of 100 kph, while the Yen Bai-Lao Cai section has two lanes and a limit of 80 kph, said Mai Tuan Anh, general director of the VEC. The expressway features 120 bridges, including two large ones that span the Hong and Lo Rivers. It also has a 530-meter long tunnel, 13 toll collection stations and five rest stations. The expressway will help shorten the travel time from Hanoi to Lao Cai from the current seven hours to 3.5 hours, VEC said. In addition, vehicles using the expressway will use less fuel, as they won’t have to stop frequently. The new facility will also help ease traffic density, as well as traffic accidents, on National Highways 2, 2B, 32C and 70. Eight traffic rescue vehicles, six ambulances, two fire engines and six patrol traffic cars are intended to be used on the new expressway to deal with any problems that may occur. In case of incident, travelers on the expressway can call the emergency line at 1900 545 592, and rescue workers will arrive within 15-30 minutes, Nguyen Van Nhi, deputy general director of the VEC, said. To build the expressway, more than 2,000 hectares of land were been cleared, and over 25,000 households were relocated to 99 resettlement areas, the VEC said. For drivers that use only parts of the expressway, the toll rate is VND1,000 ($0.047) per km for cars using on the two-lane section of the road, and VND1,500 per km for cars on the four-lane section. For drivers who use the whole route, the minimum toll is VND300,000 ($14.2) per vehicle for vans with under seven seats; while the maximum rate of VND1.22 million ($57.5) per vehicle applies to trucks with a load of over 18 tons, or those carrying a 40” container, the VEC said. The expressway is part of the China’s Kunming – Vietnam’s Hai Phong Transport Corridor and belongs to the Greater Mekong Subregion (GMS) cooperative program linking Vietnam, Laos, Cambodia, Thailand, Myanmar, and China.